The nationalist right, Alternative for Germany is now polling as the single most popular party among Eastern German voters. This poll recently published on Europe Elects is shocking the mainstream globalist elites in Germany and indeed throughout Europe. The AfD, the Alternative for Germany, for the very first time ever has surpassed Angela Merkel’s Christian Democratic Union to take first place as the most popular party in East Germany. It is polling at 27 percent support among Eastern Germans, while the same poll shows that Angela Merkel’s CDU has in fact plummeted to 23 percent support, which is the lowest result, I believe, in the last several decades. The leftwing Social Democrats or SPD also dropped in this poll to barely 15 percent support. There is a clear trend of the political right ascending and the politic left faltering. What is so interesting here is that this poll seems to corroborate another poll taken a couple of weeks back among Bavarian voters showing that the Christian Social Union, the ruling party in Bavaria, is falling in its polls, largely because of the fallout over its coalition with Angela Merkel’s CDU. This is going on all the while the AfD is rising to about 17 percent support in the region. If you don’t know, Bavaria has its elections next month and the Christian Social Union is doing everything it can to stave off this challenge from the AfD. Now, if these polls are indeed reflective of very real trends going on in Germany, then I believe we may in fact be seeing the real effect of the Chemnitz protests, which were in response to two immigrants who allegedly stabbed to death a German man, the real effect in terms of the kind of corroborative evidence that underscores what we talked about previously. If you recall, we looked at studies that examined the political effects of terrorist attacks over the course of several years, and what these studies found was that there was a clear pattern of populations turning to the nationalist right as a response to terrorist attacks. Keep in mind, all of this is going on against the backdrop of another murder of a German man in Saxony allegedly by some Afghan migrants over the weekend. This is not something that is going to end anytime soon. Immigration violence is now a new normal in European nations and will only serve to intensify the support of nationalist populist parties. However, this is not limited to those on the political right; as we reported last week, even the far-left Die Linke Party is turning to the right in terms of immigration;.even the political left in Germany is talking about closing the borders and stopping immigration, since unfettered immigration is completely inconsistent with maintaining social services and the welfare state. Needless to say, Merkel and her center-right coalition is in effect being squeezed from both sides of the political aisle, and as such, there does appear to be a major political realignment happening throughout Germany. Keep in mind that the AfD is not just syphoning off votes from the center-right coalition, from both the Christian Democratic Union as well as the Christian Social Union in Bavaria. Amazingly they are also becoming very popular among traditionally leftwing strongholds such as the once industrial heartlands of Western Germany. In fact, surveys have confirmed that the vast majority of AfD voters affirmed that they voted for the party because they had become so disaffected and disillusioned with the mainstream parties, both right and left. Sound familiar? This is precisely the same pattern we saw with Donald Trump, where states that had been reliably leftwing in their voting since the 1980s suddenly voted for Trump, these were states like Wisconsin, Iowa, Michigan, and Pennsylvania which are industrial and manufacturing centers which turned away from the political left and embraced the nationalist populist right. Of course, I need not tell you, but the success of the AfD, like with Donald Trump, is largely due to the whole issue of immigration. The AfD is unapologetic when it comes to their staunch resistance against Merkel’s policy of open borders. In fact, this is the key reason why traditionally leftist voting demographics, such as the industrial workers, have been voting AfD. Union workers are listening to their representatives, aligned with the social liberals, actually defending mass immigration; in Germany, these union reps are coming out and saying that skill shortages among Germans means that Germany needs even more immigration. They fully support Angela Merkel and her plan to completely change the demographics of Europe; as you can imagine, this pro-immigration rhetoric does not sit too well with union members, the rank and file, the common folk as it were, who want to talk more about the shortage of decent manufacturing and industrial jobs, since they are all being shipped overseas on account of a globalist division of labor. And of course, it is precisely the AfD that is addressing these economic and immigration concerns. We will be keeping our eyes on how things develop in the run up to the elections in Bavaria; this of course on the heels of the nationalist Sweden Democrats and the gains that they made in their last election in September. Together with the rise of the right in France and Italy and Austria, this really does mean that we are seeing nothing less than the rise of a new political order sweeping the continent of Europe for generations to come. The European Summit is ‘Make-or-Break’ for Merkel and the EU!!! 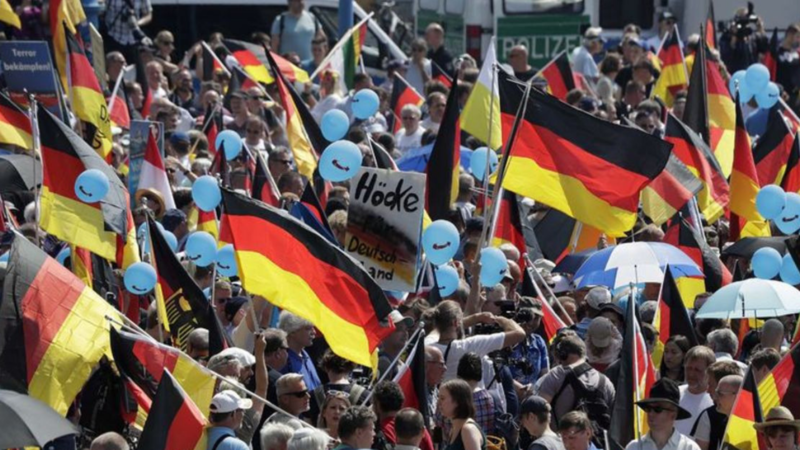 AfD Becomes Second Most Popular Party in Germany!! !